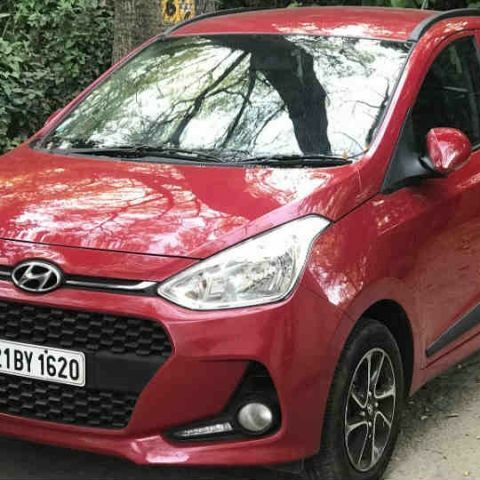 The 2017 Hyundai Grand i10 keeps the essence of the old popular hatchback and brings new upgrades that are more than welcome in this sporty new avatar. Hyundai always seems to get its car designs right. Be it the new Elantra or the Tucson, Hyundai’s smooth flowing design language is pleasant on the eye, and makes its cars look quite appealing. Alongside the new designs, Hyundai is also steadily including more technology in its new cars - the Hyundai Elantra, for instance, gets keyless entry, auto-folding mirrors, cooled seats and an infotainment console that includes Apple CarPlay, Android Auto and a very intuitive sat-nav unit. The 2017 Hyundai Grand i10 here is equally appealing, and much of its new upgrade has to do with the significantly upgraded infotainment system. 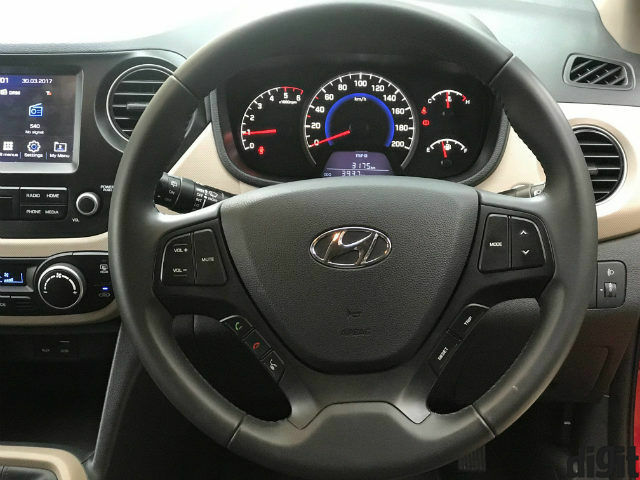 The car now boasts of Apple CarPlay and Android Auto in the simple, smooth Hyundai interface, along with small elements like gear shift indicator in the MID, automatically folding mirrors, daytime running lights, rear seat headrest adjustment, coat hanger and more. Coupled with the slight facelift on the outside, the new Grand i10 raises the bar in the extremely competitive hatchback segment that has prime players like Maruti Suzuki, Tata Motors, Ford and Honda all vying for the same target audience. We begin with the new infotainment system that is the biggest upgrade here in the new car. 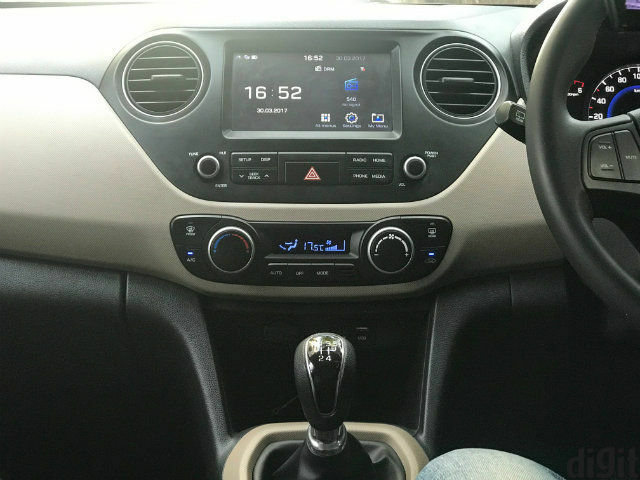 The 2017 Hyundai Grand i10 Asta (the top variant) includes a 7-inch multi-colour touchscreen panel running on Hyundai’s own infotainment software. The interface remains the same as what we have seen in previous Hyundai cars, and has a simple layout that is easy to use. You are initially greeted with a splitscreen view, with the date and time to the left, and more options to the right. You get an app drawer of sorts that opens up all the options of the infotainment system. You get eight chunky icons on each screen, and the large icon size makes it easy to tap on the options even when you are not looking at it. Tap on the ‘All Menus’ option and you are greeted with eight icons - Radio, Music, USB, Images, Aux, Phone, Apple CarPlay and Android Auto. Swiping to the next screen shows only two icons - MirrorLink and Settings. 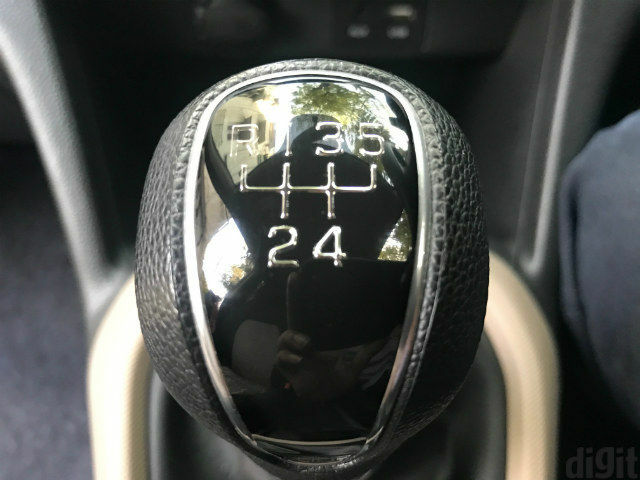 All of these complete the number of features that you get with the new infotainment system, which can be controlled from the Settings tab. The Settings tab further takes you to controls for Sound, Display, Phone (which also controls Bluetooth pairing), Phone projection (to enable/disable Apple CarPlay, MirrorLink and Android Auto), Date/Time, Language, Keyboard, Screensaver and System settings. Phone settings allow you to setup Bluetooth devices, select priority device and choose Bluetooth device name and visibility. Once you are paired via Bluetooth, the phone contacts download automatically to the infotainment system along with call logs. You can also play tracks wirelessly and access your local tracks from the infotainment system’s music interface. However, you do not get to view images on the console with Bluetooth connectivity, and will require a USB drive for viewing photos on the go. The system also does not support video content playback, but looking at its price segment, we did not really expect it to. The 2017 Hyundai Grand i10 gets four speakers inside, which can be controlled with a number of options. These options include Position - the speaker balance pointer that allows you to choose where the audio will come from, a three-band equaliser with controls for Treble, Bass and Mids, Loudness setting to automatically decrease music volume while reversing and upon startup, and Speed-dependent volume adjustment that intelligently restricts the music playback volume when you are travelling at higher speeds. The interface is fairly simple, showing the album art, phone, artist and track names, and a Menu tab from where you can access connection settings to quickly switch between paired devices. The overall system is really responsive, and allows easy operations without too many jitters. The four speakers seem about adequate for a car of this size, and the audio quality itself is decent for being the default speakers in a value-for-money car. There is a notable brightness in the audio, and the entire setup is sufficiently loud. Purists may cringe a bit when it comes to the overall fidelity, but chances are quite slim that you would really be looking for high definition audio quality over here. The system provides support for Android Auto and Apple CarPlay, which is among the first in this segment in India. The addition of Android Auto is particularly important as this brings with itself Google Maps, and the default infotainment system misses out on a satellite-based navigation unit. Connectivity for both Apple CarPlay and Android Auto works smoothly, although Apple CarPlay does not add much functionality except for message read-out with Siri. Android Auto, meanwhile, adds support for WhatsApp notifications and voice-assisted calling, alongside Google Maps. The large display also makes usage quite easy, and the slight recess in which the matte display is housed slightly improves sunlight visibility. The small multi-information display only shows multiple trip details including distance covered, mileage and distance to empty. The monochrome display does not show any entertainment information, for which you rely on the main display itself. In the instrument cluster, the number of warnings and alerts include gear shift warning, door/tailgate ajar sign, driver seat belt and reserve fuel indicators. The steering wheel, though, includes multimedia controls, with volume and mute buttons to the left and the mode and track change buttons to the right. The Mode button controls input mode and allows you to shift between Bluetooth audio, aux, USB and Radio without taking eyes off the road. Controls for telephony are included to the bottom left edge of the steering wheel, and the single Trip button sifts through the options on the MID. The entire layout of operations here is very easy, and the soft buttons make operations easy. The tactile feedback is good, and the buttons feel well built. 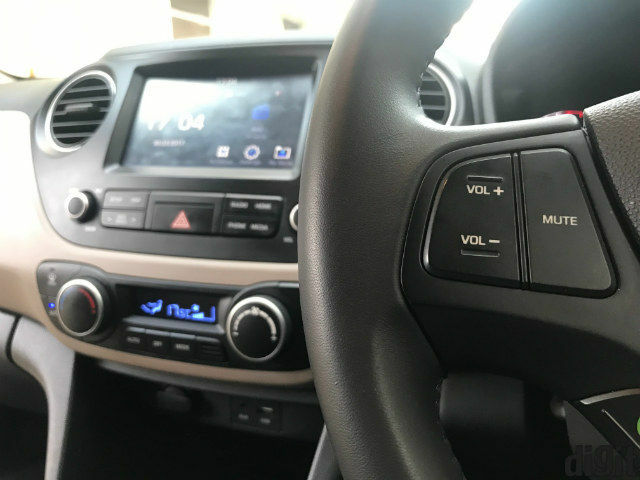 Some of the unique features of the 2017 Hyundai Grand i10 includes automatically folding ORVMs, auto-wind down driver window, coat hangers and AC vents to the rear, cooled glove box, height adjustable steering wheel, keyless entry, daytime running lights, a reverse parking camera with static guide rails, new ‘diamond cut alloy wheels’ with roof rails and rear spoiler, and adjustable rear seat headrests (the front seats are a single unit). The rear parking camera is accompanied with rear sensors to aid parking. The rear window also gets rear window defogger and rear wiper, and other safety features include impact-sensing doors (which we did not need to test, and happily take the company’s word for it), front driver and passenger airbags and ABS. The interior buttons include blue backlighting for all the physical buttons, most of which are placed underneath the main display. The buttons allow almost full control of the infotainment features if you don’t prefer the touchscreen input. The front also gets automatic lamps and a boot lamp to make storage easy at night. 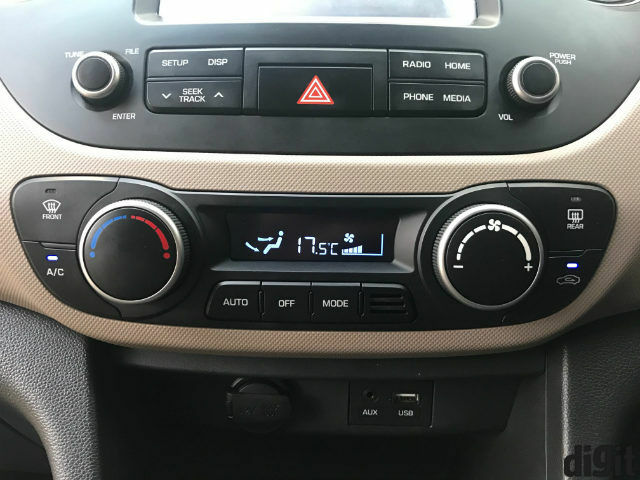 In yet another unique addition for this segment of hatchbacks, the 2017 Hyundai Grand i10 gets automatic temperature control with the single-zone air-conditioner. 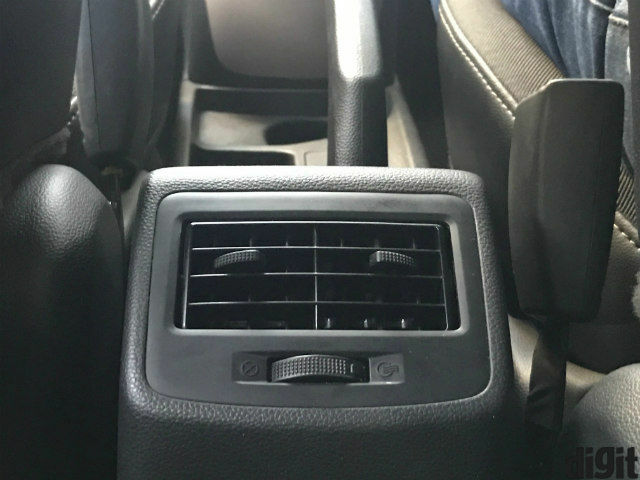 The rear bench gets a power outlet as well, alongside the air vent. 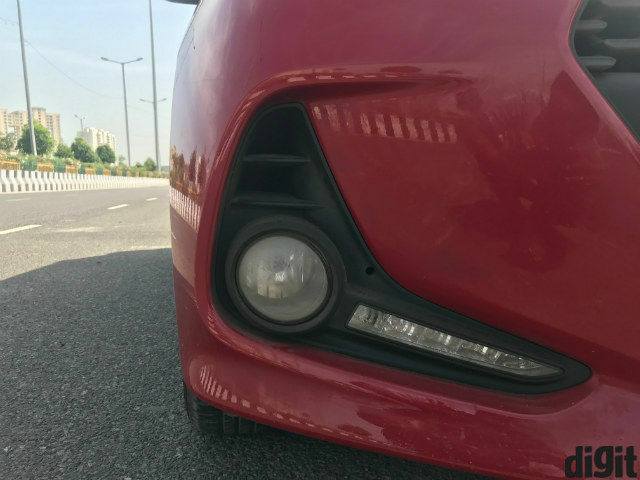 The front fascia gets a slight upgrade to add more definition, with a redesigned, black air dam that gives a larger grille, a chrome line on the top, recessed fog lamps with accompanying DRLs, and a redesigned rear bumper with similar design language as the front. There isn’t much else about this car’s design that has changed, but that is a good thing. The 2017 Grand i10 looks quite decent, with its tall-ish stance that makes it stand out against the shorter, flatter Ford Figo, Tata Tiago and the likes. 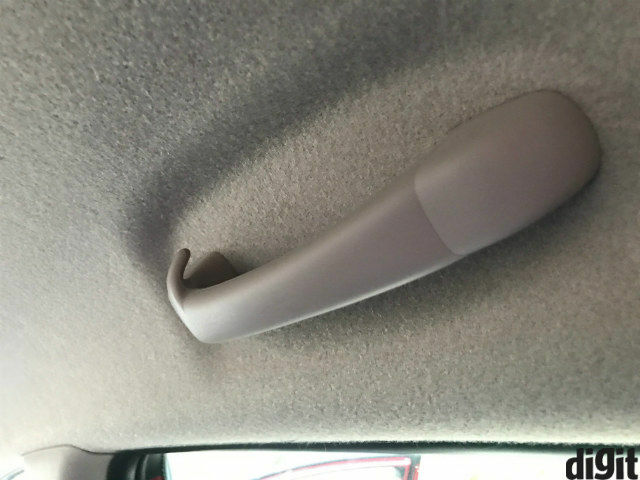 The interior has a pleasant dual-tone fabric upholstery, and the plastic parts do not feel too inexpensive. When it comes to the drive, Hyundai has upgraded the engines as well, and the car now includes 1.2-litre petrol and diesel engines. We drove the petrol variant, which feels zippy in city traffic. The engine is quick to respond, and focuses on mileage to give you the most of the fuel you load. With 81 horses of power, the engine does feel somewhat out of depth when on the highway, and you would not be encouraged to push the car beyond 110kmph. It is a thorough city car, which is fun to drive around in city traffic. Adding to the engine is a retuned suspension that is now softer to give a more planted ride, and a more well-balanced steering that does give some amount of driving feedback. The rear seats are also quite comfortable, offering good thigh support and adequate head and knee room. 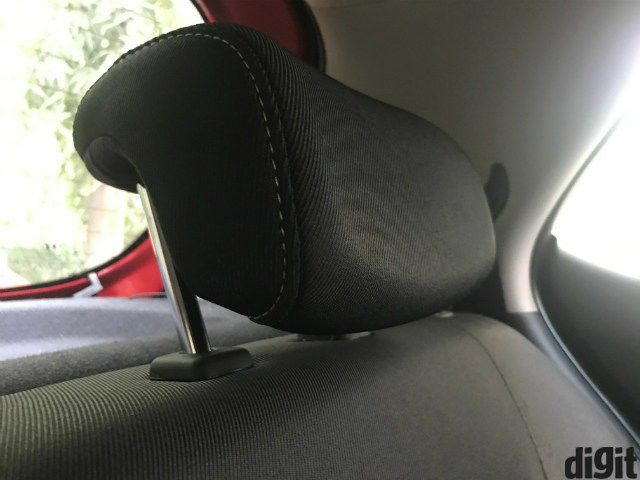 You do sit rather stiff, but get good lumbar support to hold you in place during a long journey. The 2017 Hyundai Grand i10 can seat three at the back with reasonable comfort, but as with most hatchbacks, you would get a little uncomfortable after about an hour and half of traveling. 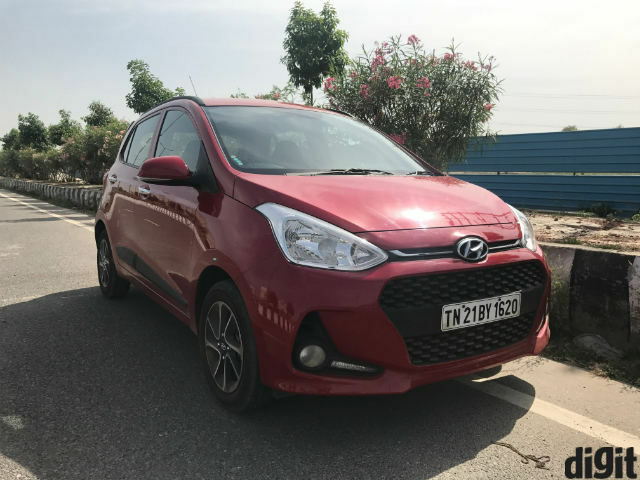 The 2017 Hyundai Grand i10 offers better overall ride quality in comparison to the Tata Tiago, in terms of NVH refinement. 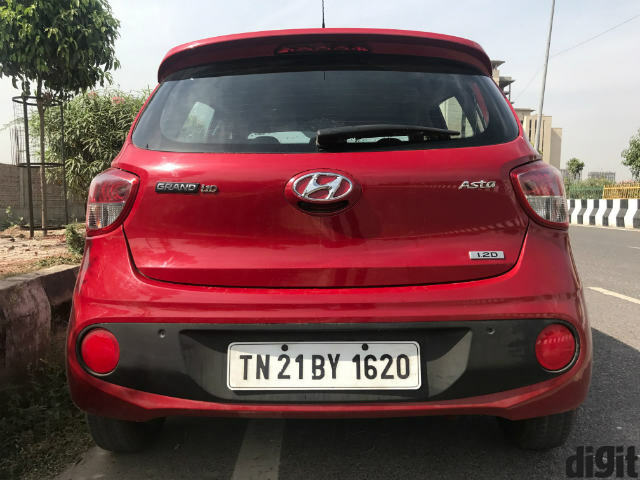 It feels smoother than the Tiago, and with a pretty able infotainment system and a host of other additional features which you may not give much thought about, makes for a compelling package at this price. At Rs. 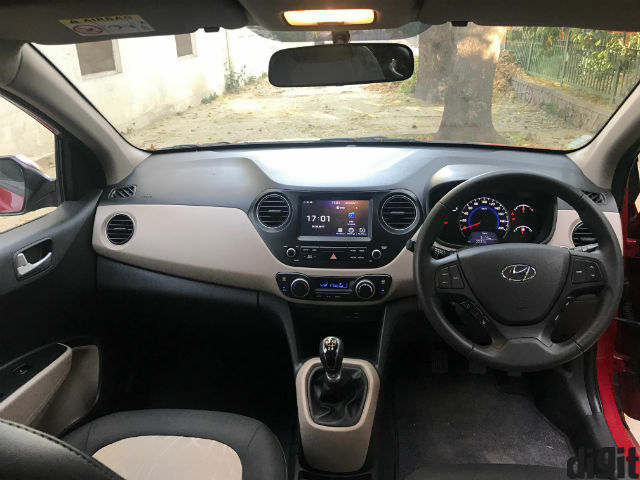 6,41,000 (ex-showroom, New Delhi), the new Hyundai Grand i10 is a modern package that presents all the essentials in a refined packaged, alongside presenting limited maintenance expenditure. Such combination, in the value-sensitive Indian market, can never really go wrong.